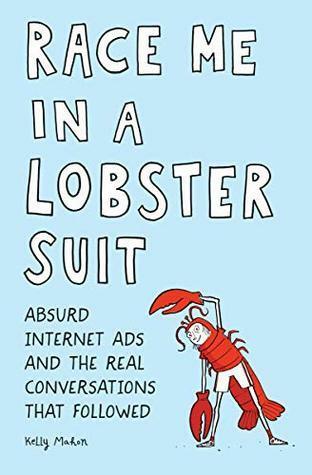 Sign into Goodreads to see if any of your friends have read Race Me in a Lobster Suit. Maureen wrote: "That’s an excellent review Julie, very interesting 😊💕"
Richard wrote: "Great review Julie ......... I know what you mean, going all out for the ultimate laugh can render the gag/ prank less funny ......"
Fantastic honest review Julie! I think I’ll pass on it but I love your thoughts! Susanne wrote: "Fantastic honest review Julie! I think I’ll pass on it but I love your thoughts!" Mackenzie wrote: "Wonderful review, Julie! Sorry this one didn't work for you"
KAS wrote: "Many people’s sense of humor have me shaking my head most of the time, too, Julie! Sorry this was a bit silly of a read for you :( Excellent, thoughtful review!! 🌸💕🌸"
Lisa wrote: "Fab review Julie😊"
Mary Beth *Traveling Sister* wrote: "Awesome review, Julie! Hope your next one is amazing. 🌺❤🌺"
Jaline wrote: "Captivating review, Julie! I can definitely see that this one would hit my "irk button", too! 😉❤"
Tina wrote: "Nice, honest review Julie!" Nicola wrote: "Fantastic review Julie! Humour is a difficult one! I don’t like humour at other people’s expense either. 💖💕"
JV ❄️☃️❄️ wrote: "Fabulous write-up, dear Julie! Hope your next one is better! 🤗"
Fantastic review, Julie! Sorry you didn’t fully enjoy.! Julie, probably not for me either ! Meredith wrote: "Fantastic review, Julie! Sorry you didn’t fully enjoy.!" Angela M wrote: "Julie, probably not for me either !" I'm personally not a fan of humor that requires making fun of another person who is unwittingly part of the joke. Pass. Thanks for the review/warning. Holly wrote: "I'm personally not a fan of humor that requires making fun of another person who is unwittingly part of the joke. Pass. Thanks for the review/warning." The problem I see is, if someone responds to the ad, that means they want the gig. They probably need the money. It's kind of mean to waste their time. Even if it "should" be evident that it's a joke. Julie, you read such an interesting range of fiction and non-fiction. I would agree with you that it is hard to believe that people respond to outrageous ads on the internet. Some people seem to be so isolated and desperate that they put themselves in harms way like that. I find that we have to so careful about social media. I don't post on Twitter or Instagram because I just don't have the time to be on media all day long. I am so thankful for Goodreads: we can chat and find out about new (or old) books and share our love of reading. I might check this book out if it is available at my library. Thanks so much for the excellent and thorough review, Julie. Amy wrote: "The problem I see is, if someone responds to the ad, that means they want the gig. They probably need the money. It's kind of mean to waste their time. Even if it "should" be evident that it's a joke." Susan's Reviews wrote: "Julie, you read such an interesting range of fiction and non-fiction. I would agree with you that it is hard to believe that people respond to outrageous ads on the internet. Some people seem to be..."
Great review, Julie. I’m sorry it wasn’t better for you. Jennifer wrote: "Great review, Julie. I’m sorry it wasn’t better for you."